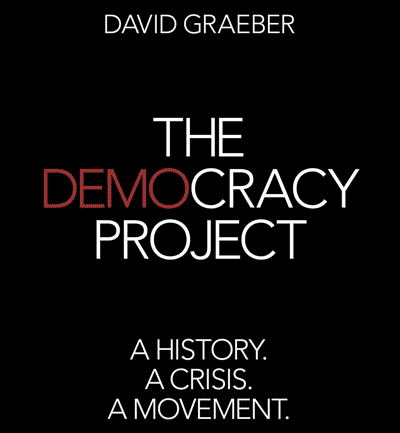 Understanding social movements, what causes them and makes them succeed, are the elusive questions that David Graeber’s latest book, The Democracy Project. A History. A Crisis. A Movement, confronts in response to the contemporary Occupy movement. As in his previous works, this book is a rich mix of styles combining first-hand ethnographic accounts of his time with Occupy Wall Street (OWS), political-economic analyses into the contemporary crises of capitalism, fascinating historical anecdotes on OWS’s many predecessors, and some inspiring commentaries on the tactics and strategies for making change happen. What immediately marks this contribution out from the increasingly large catalogue of books on Occupy, and indeed from much of Graeber’s own writing, is that it reads from the start as a book intended to be used as a tool by Occupiers and other activists involved in horizontal movements, rather than to feed into academic debates or public discourses over OWS’s significance. As he has talked about before, this book should be seen as a gift — a voluntary offering that can be used in whatever way people see fit — but also hopefully as a reflexive moment of facilitation as we navigate our way through the current wave of radical democracy building. The beginning of the book gives us the most exciting insights into the early stages of OWS. Through vivid descriptions of the initial battles between the so-called ‘verticals’ (for whom politics is about talking at other people before leading others on a march) and the ‘horizontals’ (who actually value collective-decision making and real participation with others), and how they collectively formulated the ‘We are the 99%’ slogan, we are taken through the, at times fortuitous, combination of events that lead to the eruption of OWS on September 17th 2011. This fascinating history is then followed by the book’s main interest: ‘Why did it work?’ Here, Graeber addresses a question that has obsessed social movement theorists for the past four decades, since a previous generation became radicalised by the anti-war and liberation struggles. The 1960s gave birth to a school of academics, largely in North America, that formed around a shared desire of providing a cohesive body of knowledge that could help explain why social movements erupted when they did, and what conditions favoured this. Graeber, however, although a world-renowned anthropologist who has had considerable impact in areas such as value-theory, has always steered away from becoming a public intellectual on ‘how to create a successful movement.’ Now, Graeber seems more inclined to offer an analysis into the whys of success, exploring everything from impacting the mass media to creating a revolutionary movement. The Democracy Project acknowledges that it’s far too early to assess the impacts of OWS, and instead moves on to explore the complex roots of ‘democracy’, seeking to reclaim the radical roots of this word (and practice) and provides what feels like an initial attempt at a people’s history of the GA. The GA, or General Assembly, has been one of the most iconic representations of the Occupy movement, and indeed many of the uprisings of 2011. As Graeber has pointed out several times over the last couple of years, the roots of this extraordinarily democratic project, which the GA has come to embody, lies not in the bourgeois history of voting through governments, but through the diverse history of anarchism. In particular, the practice of consensus, visible around the world through the twinkling of fingers in the air at GAs, owes itself to a much deeper sense of both the desire and necessity to take direct action and “act as if one is already free.” Graeber reminds us of the debt that horizontal movements like Occupy have to previous generations of activists, in particular feminists and Quakers, who largely paved the way for the use of consensus today. The centrality given to democracy and the framing of OWS leads Graeber to develop what is perhaps the most useful part of the book: a user manual developed from collective experiences such as facilitation trainings for GAs, in which he suggests some pointers for how to manage the challenges of consensus. It also provides reflections on the tactics of taking direct action, dealing with the police and finishes with a fascinating framework for thinking through what strategies might be available to the Occupy movement in a situation of dual power. These strategies are largely based on experiences from Latin America, and rightly so for it is a region that has seen just about every type of change that society could imagine in recent years: from armed uprisings, to democratic state-based revolutions, to urban autonomous movements based on non-hierarchy and the de-legitimisation of government. This shows the important links between Occupy and Latin American urban movements. In the final chapter Graeber provides space to let his revolutionary imagination develop and explore some of the main axes through which we can start to see of the world through its many already-existing anarchisms, allowing us to re-frame struggle as “a question of building on what we are already doing, expanding the zones of freedom, until freedom becomes the ultimate organizing principle.” It is in this respect that The Democracy Project becomes a tool for activists thinking through and reflecting on the many successes of Occupy. As the word Occupy itself implies, space is central to understanding the movement, and if we want to take the project of democracy seriously then we need to be urgently asking ourselves where we are going to see this develop. The book does not read primarily as a reflection on OWS, or even the Occupy movement, but on a much broader discussion into democracy, anarchism and strategies for social change. Of course there is nothing wrong with this, and indeed the title makes no pretence at providing us with a comprehensive overview of Occupy. Yet, given Graeber’s immense ability at recording events and retelling them in fascinating detail, it is disappointing not hear more about OWS apart from the build-up to September 17th 2011. One thing that is admirable in his ethnographic writings is his ability to provide such rich detail that allows anyone to get a strong sense for what was happening in the movement and then make their own interpretations. In the case of OWS, however, Graeber seems to have detached himself from the movement following its outbreak. It might be that this was a conscious decision to write less, or even to participate less in OWS as the movement became well-known, in order to avoid becoming a kind of public-spokesperson for Occupy, given his increasing fame in activist and academic circles. Whatever the reasons for us hearing relatively little about Occupy (not much more than around 50 out of the book’s 300 pages actually talk about OWS itself), it would have been interesting to hear about his experiences as someone who has been held up as such a key figure in the movement; a claim that he modestly rejects early on in the book. As someone who has been involved in Occupy in London, and has since been researching and writing about the movement, reflections on questions such as, ‘What relationships can we have with movements in our writing?’, and ‘How can we avoid becoming “spokespersons”?’ would have been useful. As the word Occupy itself implies, space is central to understanding the movement, and if we want to take the project of democracy seriously then we need to be urgently asking ourselves where we are going to see this develop. Occupy, as Graeber points out, has shown that democracy does not need, and is in fact incompatible, with the space of the state. As the movement leaves the squares and experiments with new territorialities of democracy, these are surely exciting times to be living in, as they provide a wealth of material to reflect on the revolutionary potentials that already exist today. Sam Halvorsen has been involved in various social movements over the last decade, most recently Occupy London, and is also doing a PhD at UCL on the geographies of autonomous politics based on his experiences with Occupy. He helped set up the Occupy Research Collective to provide a space for negotiating between these dual roles of researcher and activist.